Isilon OneFS 7.0 has been out for a couple months. OneFS 7.0 has brought some additional features to Isilon, particularly toward VMware vSphere support. I blogged about VASA support in another article: Configuring the EMC Isilon VASA Provider. 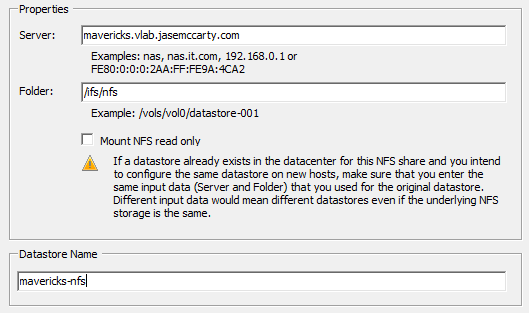 This article is going to focus on how to configure the NFS VAAI Plugin for Isilon when used with VMware vSphere 5. The installation process is not 100% straight forward according to the Release Notes, which require a support.emc.com login to get to. I’ll try to provide a little clarification here. Enable the vCenter for Isilon Service on the Isilon Cluster by running isi services isi_vc_d enable from the Isilon command prompt. In fact there is a little bit more to do. Enabling the vCenter for Isilon Service doesn’t have any requirements that I’m aware of, other than to run the command, but loading the plugin and configuring authentication can be tricky. For starters, after downloading the Isilon NAS VAAI Plugin (VMW-ESX-5.0.0-isilon_nas_vaai_plugin-1.0-offline_bundle-834058.zip), adding it to VMware Update Manager, and creating a baseline, I noticed that despite the fact that the plugin had not been installed on my hosts, it appeared to have been. I wasn’t able to push the extension to the hosts using VMware Update Manager. I have only been successful in manually installing the extension on my ESXi hosts, but that isn’t that straightforward either. I uploaded the VAAI plugin files named “VMW-ESX-5.0.0-isilon_nas_vaai_plugin-1.0-834058.zip” and “VMW-ESX-5.0.0-isilon_nas_vaai_plugin-1.0-offline_bundle-834058.zip” to my datastore and attempted to load both of them. No dice. Not until I extracted the vib (isilon_nas_vaai_plugin.vib) did I see success. *Note whether EMC_bootbank_isilon_nas_vaai_plugin_1.0-0.vib is extracted from the offline bundle, or isilon_nas_vaai_plugin.vib extracted from the other, the vib that gets installed is still named EMC_bootbank_isilon_nas_vaai_plugin_1.0-0.vib. *Note the Release Notes state a requirement to set software to CommunitySupported, this is not required as the Isilon NAS VAAI plugin is signed as VMwareAccepted. After the vib is installed, authenticating to the Isilon cluster is required. Information required includes the SmartConnect zone name, user account, and password that will be used to connect to the cluster. *Note: The Release Notes do not mention requiring the SmartConnect zone name. I brought this up to the team during the Alpha release, with the argument of having multiple Isilon clusters in a single environment, and the lack of a specified SmartConnect zone would require all clusters being connected to, to have the same credentials. I’m not certain if I had anything to do with the addition, but I’m glad to see it made it into the 1.0 release. When running this the first time, I got an error. failed to connect to https://mavericks.vlab.jasemccarty.com:8080/platform/1/cluster/external-ips, with status 7. Ok… Where do I start? There it was… What was the difference? Remember that when connecting to an Isilon cluster using the SmartConnect zone name, different IP addresses can be used when I request is sent to the SmartConnect service IP? My cluster has 3 IP addresses. 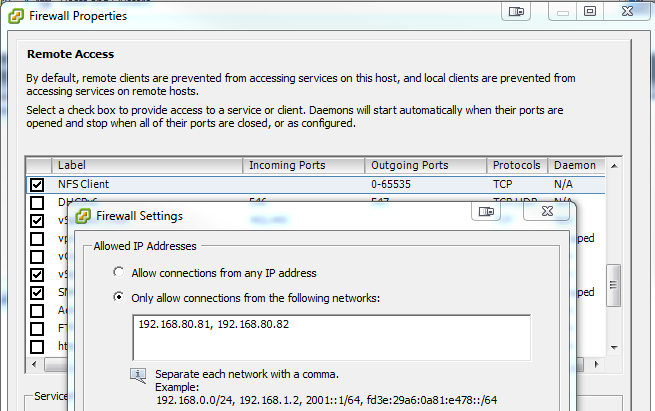 When ESXi connects to an NFS mount, the IP address of the NFS mount (using a name or IP) is then added to the NFS Client’s settings in the ESXi firewall. Looking at my NFS Client settings I found that only 2 of my node IP addresses had been added. Without adding a lot of redundancy to this post I’ll share that the primary requirement is that all of the IP addresses of the SmartConnect zone being connected to, must be in the NFS Client “allowed connections” list. Something else I found, was that if I rebooted my ESXi, when the Isilon NFS share is mounted, if the IP that is returned by SmartConnect isn’t already in the “allowed connections” list, it is added and the datastore is still mounted. Hardware Acceleration is not supported. What have I done wrong? Well, the release notes state that no reboot is required after installing the plugin. After a reboot, I saw success. After quite a bit of troubleshooting, I don’t believe it is a requirement to have the datastores mounted beforehand (after a conversation with Larry Orloff), but the requirement for all the IP addresses of the SmartConnect zone being present in the “allowed connections” and a host reboot were consistently required. I reached out to the folks that developed the plugin with a couple more questions about automating this process. In speaking with them, unfortunately in 1.0, the auth_gen process requires interactive inputs, and does not accept parameters. I’ve requested that functionality be added. Not sure if/when it will, but I’m optimistic it will at some point. I have been using the plugin with vSphere 5.1 without issue. There is an ECN thread where a user reported an issue with some vSphere 5.0.0 hosts, regarding the plugin not behaving properly. After this post published today, I reviewed the ECN article above, and took the opportunity to stand up a new ESXi 5.0 Update 1 host. Installing the plugin before any patches were applied, and rebooting the host resulted in some connectivity issues. I could ssh in, but couldn’t manage the host from vSphere. I installed all the relevant patches for ESXi 5.0 Update 1 (updated to build 914586) which results in ESXi 5.0 Update 2. With that being said, if you are running vSphere 5.0, I’d recommend you upgrade to at least ESXi 5.0 Update 2 (build 914586) before installing the plugin. If you run into any issues, I’d recommend contacting EMC Support. Additionally it would not appear there are any issues with vSphere 5.1. If you have a root password that is 8 characters, or divisible by 8, you might receive a Segmentation fault. It is mentioned in the post that it should be corrected in the next release of the plugin. You should receive something like this: Connection to SmartConnectZoneName 8080 port [tcp/webcache] succeeded! If you don’t get that, it isn’t going to work. Hy, really nice read. I was trying to find something like this from a long time. I was getting Internal error 7 at first, then I tried even disabling the firewall and use the FDQN name, there is Internal error FM1. Internal error FM001\Can you list our other possibilities? Unfortunately I don’t have a list of the possible error codes. If you follow the steps in the post, you should be successful. EMC Support would be the proper place to escalate any issues should the plugin not work for you. I don’t know any off the top of my head. I’ll ask around. In the meantime, I would suggest submitting at support ticket with EMC Support. Also, you may want to post the question on the EMC Community Network at http://community.emc.com/. Extremely helpful, especially considering EMC/Isilon’s lack of documentation. Saved my day. thanks for posting this blog. We found a documentation bug as well with EMC’s whitepaper to install the plugin and also found that its not supported with ESXi 5.0 u1 and one has to run ESXi 5.0 U2 to install the same plugin. I have drafted an article which is internal for now but once the content is approved by EMC it will be published externally. EMC TSE has reopen the bug to follow up as there are few steps which are not included in the installation process and needed to proceed further, which I believe will be included in the official documentation once get revised. So submitted the Doc change feedback as well.